404 people want to go here. 329 people have been here. 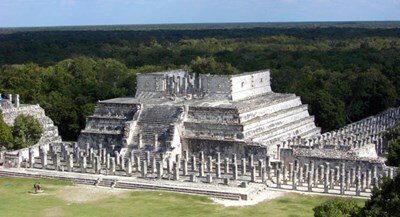 Palenque was a Maya city state in southern Mexico that flourished in the seventh century CE. After its decline it was absorbed into the jungle, but has been excavated and restored and is now a famous archaeological site attracting thousands of visitors. It is located near the Usumacinta River in the Mexican state of Chiapas, located about 130 km south of Ciudad del Carmen about 150 meters above sea-level. Day of the Dead (Spanish: Día de los Muertos) is a Mexican holiday celebrated throughout Mexico and around the world in other cultures. The holiday focuses on gatherings of family and friends to pray for and remember friends and family members who have died. 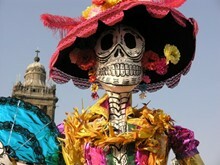 It is particularly celebrated in Mexico, where it attains the quality of a national holiday, and all banks are closed. Mexico City is the capital and largest city in Mexico as well as the largest city in the Americas and the world's third largest metropolitan area by population, after Seoul and Tokyo. Mexico City is also the Federal District (Distrito Federal), the seat of the federal government. It is a federal entity within Mexico which is not part of any one of the 31 Mexican states but belongs to the federation as a whole. Chichen Itza is a large pre-Columbian archaeological site built by the Maya civilization located in the northern center of the Yucatán Peninsula, in the Yucatán state, present-day Mexico. Chichen Itza was a major focal point in the northern Maya lowlands from the Late Classic through the Terminal Classic and into the early portion of the Early Postclassic period. Cabo San Lucas, commonly called Cabo, is a city at the southern tip of the Baja California peninsula, in the municipality of Los Cabos in the Mexican state of Baja California Sur. As of the 2005 census, the population was 56,811 people. It is the largest community in Los Cabos municipality, and the second-largest in Baja California Sur, after La Paz. Cabo is known for its sandy beaches, several world-class Scuba diving locations, and the distinctive sea arch El Arco de Cabo San Lucas. Mérida (T'hó' or Ichkanzihóo in Modern Maya) is the capital and largest city of the Mexican state of Yucatán and the Yucatán Peninsula. It is located in the northwest part of the state, about 35 km (22 miles) from the Gulf of Mexico coast. The city is also the municipal seat of the Municipality of Mérida, which includes the city and the areas around it. According to the 2005 census, the population of Mérida was 734,153, ranking 12th among the most populous Mexican metropolitan areas. The historic center of Mexico City is also known as the "Centro" or "Centro Histórico. " This neighborhood is focused on the Zócalo or main plaza in Mexico City and extends in all directions for a number of blocks with its farthest extent being west to the Alameda Central The Zocalo is the largest plaza in Latin America and the second largest in the world after Moscow’s Red Square. It can hold up to nearly 100,000 people. The town of Santiago de Tequila was founded in 1530 by Franciscan monks on the orders of Fray Juan Calera. In 1600 was established the first distillery of agave, which was previously consumed but not distilled, creating like this the first tequila factory itself. Rio Secreto is also known as Mexico’s underground river. While just recently becoming a tourist destination, it’s likely that Río Secreto patrons will only grow. After all, with its thousands of stalactites and stalagmites along the river’s edge, visitors are left feeling as if they have traveled back in time, and to a place untouched by human hands. The underground passageways of seemingly endless tunnels stun the senses and will absolutely take your breath away." Vast, mysterious and enchanting, the ruined city of Palenque is considered to be the most beautifully conceived of the Mayan city-states and one of the loveliest archaeological sites in the world." Part of the appeal of Potrero Chico is, put simply, the easy—and cheap—living. By day, climbers ascend spires like Crash Test Dummies, an exposed two-pitch 5.9 with an enviable view over the verdant valley at the top. Come evening, they buy fresh veggies and fruit at the local markets, then gather in campgrounds like La Posada to cool off in the pool, share stories, and drink margaritas in the shade.